Football v Homophobia (FvH) is an international initiative opposing homophobia in football, from grassroots level to professional football. FvH, in partnership with Fare Network, uses football as a tool to challenge discrimination against LGBT groups and remove prejudice based on gender identity and sexual orientation. 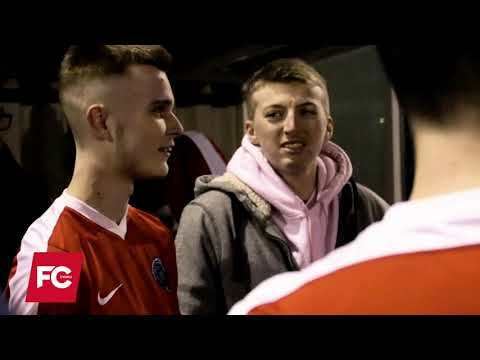 In the latest episode of FC Cymru, the team caught up with Cardiff Dragons FC (Wales’ first and only LGBTI+ football team) during their FvH match against Cardiff Met Staff on Wednesday 13th February as a part of FvH month of action. The annual game, played in an inclusive and friendly environment, looks to increase a feeling of community for LGBT staff and students at Cardiff Met and a feeling of belonging for the LGBTI community in football. Cardiff Dragons exists to promote participation in and awareness of football, social cohesion and healthy lifestyles within the LGBTI community in Cardiff, South Wales and beyond. “We have found that everyone that has been involved has said they have got something big out of being a part of this team, whether it has been forming a friendship, increasing their confidence or getting better at football. It helps people from all levels, it may help them come out, increase their confidence and can even educate people within the game”. Cardiff Dragons Second Manager and Player Dario Gutier adds that Cardiff Dragons do not judge a person’s sexuality, where they are from or how they play, “as a professional, it doesn’t matter if you are gay or not, football is football”.